That’s not an admission many would find interesting or appealing. More often than not, such a revelation has, in the past, invited more disdain than anything else. Usually, they are of the mildly amused kind. Nothing threatening or malicious there, at least to the best of my understanding. Nonetheless, there is a clear lack of acceptance of professional wrestling by many people on a more serious level. It is relegated to a more kiddie category, one that lacks the credibility often afforded to other forms of sports and entertainment. It is an unfair comparison to make in many ways, primarily because it is both sports and entertainment, a social media phenomenon that is also a film production company in its spare time. This is not to say that sports can’t be entertaining. If anything, it can appeal to the very base of our tribal senses whenever we hold a personal stake in the match involved. This can be from a long-standing interest held in the performer to more nationalistic objectives at play. Watching the Malaysian national football team take on Indonesia, for example, will always stir the hearts and minds more aggressively than seeing our boys take on (and lose to) Tajikistan. A similar notion exists in professional wrestling as well, with certain characters encouraged to espouse specific nationalistic spiel when the time suits them. And therein lies a large part of the criticism against the art. The very fact that it was arranged beforehand does, for many, take away the mystery of what would happen next. In general we are driven by this very desire to know what would happen next. I mean, if everything was known beforehand, it would be such an exciting endeavour, would it? At the same time, when it comes to the arts there is a desire by many to see the ending pre-ordained according to their own tastes. In short, many look for the happy ending they can't find in life. It highlights a certain inconsistency, our willingness to expand more of our efforts and monies to secure a fixed future, and yet we are attracted to the idea of the unknown. We may fear it, but this form and level of attraction can not be denied. We are driven by the stories around us. The story and narrative is king in the determination of the course of our lives, and the fact that it is or is not real is secondary to the reality that is taking place. For it is a reality that is worth considering. The art of wrestling is one that is already intricate and impressive in its own right (not unlike the art of other arts). Trying to really hurt someone is actually quite easy: you move and hit as fast and as hard as you can. Trying to make it look like you hurt someone, however, without actually hurting them is another story. The amount of training and skill required to pull this off is incredibly high, and one that deserves a certain amount of respect. The fact that it's not real, though, as a part of a number of other factors, is the reason it is commonly vilified. Why, though? Why the common snigger amongst some and hatred between others whenever professional wrestling is brought to the table? There is an incident that illuminated this issue for me, and it may be useful for us to consider. Sometimes, prior to the start of my classes, having come over early enough to finish setting up the lecture slides and requisite videos, I am left with some time to kill. Taking advantage of that, I would often play another video, just to have something to watch. At times, I have fallen to the temptation of loading up my wrestling fix on the big screen and sound. It is, at least to me, marvelous to behold, a euphoric happiness one often get with the expansive expression of interest and passion. My students would stroll in, one by one, but I’d keep the video running; there’s still time before I’m to officially start the class. Many would, as I mentioned above, react incredulously at the idea of their lecturers being a wrestling fan, but a lot of them would sit and watch (incidentally, this is a reaction of most people I’ve come across; whatever their leanings may be, people's heads will always be at least turned to the screen). Quite a number, though, would not. They would actively turn away from the screen, almost exactly at the right moments when a body was about to be slammed into to the mat, or when a limb has been painfully contortioned. I’d ask them later about their reaction, and their response of “Ganas giler” was interesting: it was too violent for them. It is interesting, precisely because many have claimed professional wrestling to be fake. Yet here is a significant enough sample size to indicate that the level of aggression was not something they can or are willing to take. 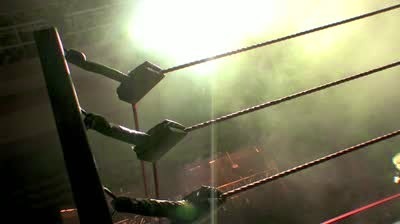 Professional wrestling may have similarities to the movie industry in the telling of unreal stories in an unreal way. However, in the movies, many can console themselves that it’s not really New York City that’s being demolished, but a computer generated rendition of it. Similarly, on screen deaths performed by actors covered in blood or blown to bits are received as the performances they are. Capable of inspiring real emotions though they were, a significant amount of thanks must be given to the costume, makeup, art and (again) CGI departments. That’s not really the case with professional wrestling. In wrestling, what we see is what we get. Somebody’s head being bashed off the ladder step is…somebody’s head being bashed off the ladder step, however controlled that movement may have been. The Undertaker, performing a chokeslam by grabbing someone’s throat before lifting them up and slamming them on their back, is still another human being throwing a body to the ground at great speed. It is then I realise that perhaps at least a part of the reason why many is not so into professional wrestling is not necessarily because it is fake. Quite the opposite, in fact. Could the high nose snobbery aimed at professional wrestling be an attempt to mask this? I wonder whether it is something is pushed to the margins and presented as fake because some find it too real to take. Baudrillard would have loved this.